Looking for the best adjunct imaging to complement mammography for women with dense breasts can be as challenging as reading the mammograms themselves. Comparing the functional imaging that comes with nuclear gamma imaging modalities such as molecular breast imaging (MBI) and breast specific gamma imaging to anatomical imaging of ultrasound and MRI results in debates over the pros and cons of these options. The need for images to drive diagnosis and treatment decisions is continually weighed against the chance of false-positives and the potential long-term effects of radiation exposure. Research involving MBI as an adjunct to mammography for women with dense breast tissue is building, particularly as it pertains to reducing radiation exposure. A Mayo Clinic study published in February in the American Journal of Roentgenology shows a reduction in radiation doses from 20 mCi to 8 mCi, a dose level not achievable with older-generation gamma imaging systems. In the study, adding MBI to mammography resulted in the detection of an additional 8.8 cancers per 1,000 women screened. Among those cancers found with mammography and MBI, 79% were invasive, and 82% of those classified as node negative. For some, MBI already has a regular role in breast cancer detection. "MBI is everything we look for in a modality," says Robin Shermis, MD, MPH, medical director of ProMedica Breast Care in Toledo, Ohio. "With MBI, there's not much left to interpretation. Either there's a hot spot or there isn't. It's black or white." That functional view of the body provided by MBI is a unique aspect that some radiologists believe brings the necessary clear view of what might be hiding in dense breasts. Rachel F. Brem, MD, FACR, FSBI, director of the breast imaging and interventional center department of radiology at George Washington University, says that obtaining this cellular look at what's happening, rather than simply an image of the tissue, gives MBI an edge in screening dense breasts. "Nuclear medicine is the physiological approach to looking for potential cancers," Brem says. "With the injection of radioactive tracers we can see how cancer functions and what it looks like in the body." Shermis, who is also a member of the Radiology Today editorial advisory board, says that ultrasound has been the go-to adjunct modality to mammography for women with dense breasts. However, he believes the sensitivity of ultrasound, without the specificity, leaves too many questions regarding what radiologists are actually seeing in the breast. "With ultrasound, you find lots of things but you don't know what's important," he says. "Ultrasound creates worry and call-backs. I believe ultrasound provides a quagmire of information. It's like chasing your tail. That makes it difficult to use for screening purposes." Ultrasound carries weight with many breast imagers because it is noninvasive, does not expose patients to radiation, and is more widely available than gamma imaging or MRI. Jean Weigert, MD, FACR, director of breast imaging with the Hospital of Central Connecticut, says that even though her facility has one of only two MBI systems in the state, she's still a proponent of ultrasound as a follow-up to mammography. Her group uses ultrasound as adjunct screening for women with dense breasts. Among women whose mammograms were negative, they're finding an additional three cancers per thousand patients screened using ultrasound that would have otherwise been missed. "Analyzing data gathered from four years of screening women with dense breasts with both mammography and ultrasound shows that we find small cancers with ultrasound," Weigert says. Weigert was involved in a retrospective study that analyzed data gathered from two radiology practices in Connecticut, looking at women who underwent mammography and ultrasound from October 2009 to December 2013. Presented at the 2014 San Antonio Breast Cancer Symposium, she reported that during those four years, the proportion of women with breast cancer among those who had a positive breast ultrasound result went from 7.1% the first year to 17.2% in the fourth year. "In four years' time we learned how to better identify what we see in breast ultrasound that may truly be cancer," Weigert says. She says her hospital now has positive predictive value (PPV) of more than 20% in women with dense breasts who undergo ultrasound as an adjunct screening exam after a negative mammogram. She says that during the first year of adjunct screening, the same PPV rate was approximately 6%. However, when using ultrasound, Weigert notes, automated breast ultrasound helps with consistency of images, particularly for comparing annual views. Handheld ultrasound, which is more operator-dependent, can complicate trying to identify whether or not a particular area of the breast has changed from the last time that area was examined. "Our goal is to find small, node-negative invasive cancers before they become node-positive," she says. "If you see a difference from year to year, you know you need to look further and possibly biopsy an area where change is evident. If you're using automated ultrasound, you will have the same images to review every year. With handheld ultrasound the images would probably be different." Also, with automated ultrasound, a radiologist is reviewing the images directly, which Weigert believes adds to the consistency factor. Practicing in a state where dense breast notification legislation was enacted in 2009, Weigert says hospitals and imaging practices in Connecticut have spent "extensive time" looking at all modalities from the perspective of what serves best as an adjunct to mammography in the most cases. As an early adopter of MBI, Weigert says the modality can help in certain circumstances, but isn't necessarily the best first adjunct modality once dense breasts are discovered with mammography. "We're finding that MBI is more accepted as an adjunct and for use in screening, but only when used under the right circumstances," she says. "I'm not comfortable using MBI as a screening tool in every case of women with dense breasts. I think we need more research to see the long-term effects. The whole-body dose is a concern." Shermis says ProMedica began using MBI four years ago. He closely follows the Mayo Clinic research underway regarding this evolving technology. "MBI is a powerful tool," he says. "The sensitivity and specificity of MBI is approaching that of MRI, with a 98% negative predictor. With MBI, we find what is important and what isn't." Shermis addresses the concern regarding radiation by noting that new-generation MBI provides only a 6 to 8 mCi dose. "People are hung up on the dose," he says. "The agent goes through the whole body but physicists say the dose is minimal. Dose shouldn't even be part of the equation when it comes to deciding the best adjunct imaging to mammography in women with dense breasts." Shermis explains that ProMedica Breast Care Center is large medical care provider network with several smaller satellite locations. The main center is where specialized care, such as MBI, takes place. Regardless of the location within the system, each woman starts with a mammogram or tomosynthesis. If the woman has dense breasts, along with other high-risk criteria (eg, family or individual history of breast cancer) she will receive an MRI. If the woman has dense breasts but no other breast cancer risk factors, she receives MBI as an adjunct to a mammogram. Adjunct imaging, like MBI, is performed every other year. All results are read in real time. At George Washington University's medical facility, Brem says they also tailor the breast screening process depending on the patient's status. However, that process doesn't always include MBI. "We don't use MBI with all women," Brem says. "We look at the individual cases and use risk-based screening. If the woman has dense breasts but no other risk factors, we use 3D ultrasound. But if the woman is at greater risk of breast cancer, we will use MBI or MRI. We'll use MBI if the patient is unable to undergo MRI." Patient tolerance of MBI is a consideration in making the right decision for each patient. Shermis says that, unlike other nuclear imaging modalities, such as PET, there's no waiting time after the tracer is injected to complete the imaging. Also, unlike mammography, there's no compression. "MBI is well tolerated among all patient sets," he says. "The actual MBI process takes about 28 minutes. Overall, the patient is in and out in an hour, including results." Compared with MRI, Brem notes that MBI is a more tolerable experience. Patients undergoing MBI are able to sit in an open room, she says, vs being confined inside the enclosed MRI machine. From a workflow perspective, Shermis says that adding MBI to the breast screening protocol hasn't negatively impacted workflow at his facility. "MBI images are quick to interpret," he says. "We can review results with the patient and react immediately." As radiologists continue to explore the best adjunct modalities to mammography for women with dense breasts, the question becomes whether or not industry standards should address which modalities to use and when. Weigert says ACR will be working on standards beginning in the fall. "They'll be addressing the question of what adjunct modality should be used for women with dense breasts," she says. "We want to make sure we're using the right test for the right patient." Without standards in place, Brem says, it's a matter of weighing patient needs against the solutions that can be provided by each viable technology. "We need to consider the challenges that need to be solved by using this technology," Brem says. "With ultrasound, there's no radiation, but the price you pay with using this technology is the chance of false positives. And if a woman is at greater risk of developing breast cancer, you need more specific imaging. There are nuances to each modality." She adds that, to create an algorithm to determine standards, there should be data included from a significant number of large studies. "A comparative assessment is needed to come up with best practices," Brem says. "That would be the best way to trigger patterns," Brem says. "We currently have a fair amount of data on how to use the different modalities, along with results. We have those data but we don't have comparisons." When it comes to MBI, Weigert says the technology has "come a long way," but believes that, as with any new technology, it's important to spend the time gaining a better understanding of the technology and where best it could be used. "We need to look at the science and wait for the research before establishing protocols for use," Weigert says. For now, which modality is best for use as an adjunct to mammography for women with dense breasts is up to physicians and patients to determine, looking at what's best for the patient. "It all comes down to what you feel comfortable with and what fits into your workflow," Shermis says. — Kathy Hardy is a freelance writer based in Phoenixville, Pennsylvania. 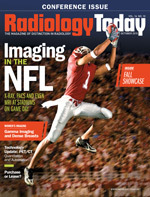 She writes primarily about women's imaging topics for Radiology Today.